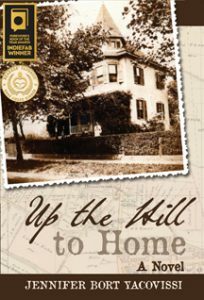 One reviewer aptly characterizes this enjoyable book as a “domestic historical novel.” The author uses diaries and letters to imagine the daily lives of her mother’s family from 1895 to1933 in Washington, D.C. The bulk of the novel consists of the author’s attempt to fill in the background, often in considerable detail, of what lay behind the material she quotes. This long chronicle of everyday life is given a bit of suspense through an unusual technique. In the first chapter, Lillie Beck, the author’s grandmother, falls down the cellar stairs, an accident which starts a severe “coughing fit,” the outcome of which is continued in eight chapters spaced throughout the story and not revealed until the end. Since we are given the material that the author presumably uses to create this chronicle, it becomes a story in which we watch a historian making up a story to account for all the gaps between public records, documents, photographs, and family tales that have been passed on. The use of the historical present tense enhances this impression. It as if the author is telling us that the characters “do” these things in her mind as she imagines them. The period covered includes the Civil War. The letters of Christian Miller, a family member serving as a medical officer in the Union army, give a fascinating glimpse of a man whose questionable motives and qualifications require the family to come to terms with the weaknesses and strengths of his character. The novel also gives an interesting picture of what daily life must have been like in the nation’s capital during the war. The First World War, however, apparently had no effect on this family. They are Bavarian immigrants, and offspring of Bavarian immigrants, yet they express no interest in the country’s march towards war with their native land. There is no mention of conflict within these German-Americans or of any nationalist prejudice they might have had to deal with. One brief reference to this global event is in Lillie’s letter to her fiancé about two women who are “very talkative about politics and the war, which of course did not interest me and therefore was more of an annoyance.” Another is a mention that the Pope wishes that “the war in Europe may stop.” This family is only interested in getting by from day to day, and it is the description of those efforts that the novel focuses on.